WCCHE membership is only $25 per year and gives you access to our complete, interactive website (including member forums) as well as details & invitations for all WCCHE sponsored events. May - Senior Graduation, and 8th Grade Graduation. WCCHE families also coordinate many other activities, including a yearbook, field trip co-op, service opportunities, sports, play dates, fine arts, political involvement, camping trips, robotics, and more. WCCHE students often participate in learning centers, drama performances, music recitals, Friday Homeschool Soccer, Spelling Bee, Geography Bee, Bible Bee, and Math Olympics. WCCHE students also have the option to do Stanford Achievement Testing at the year's end. WCCHE families stay updated and connected via our online forum which is secure and private and accessible only to members. WCCHE families can find and connect with other families of similar age and interests using our secure and private member family directory. 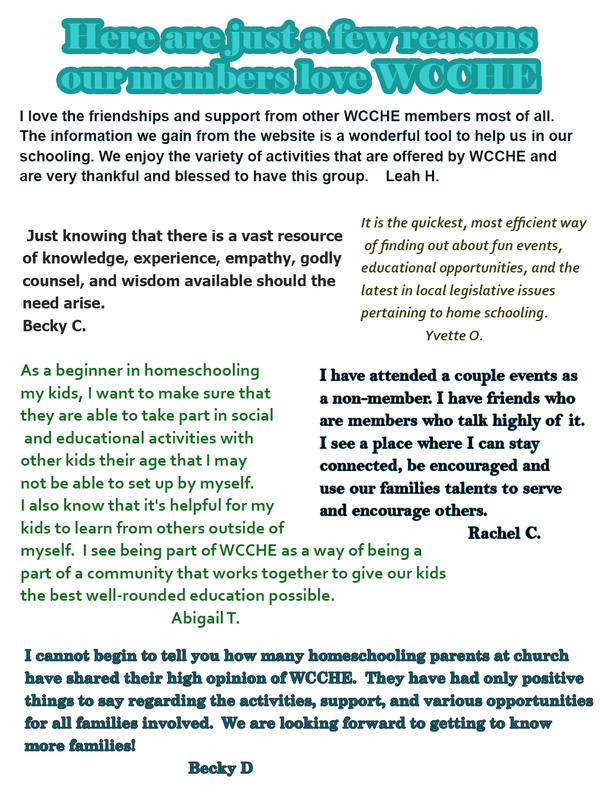 WCCHE works to continually provide helpful resources and information via our forum and website, and to coordinate opportunities for our members that enhance our home school experiences and build up a strong support community. We welcome you to browse our public site and contact us with any questions (wcchehelp@gmail.com). We would love to have you join our homeschool community! !